We’d love your help. Let us know what’s wrong with this preview of Fionn by Brian O'Sullivan. The druid Bodhmhall and her nephew Demne have survived a bloody ambush but the cost has been substantial. The Ráth Bládhma allies have been decimated, the ragged survivors strung along the banks of an isolated river valley. And their pursuers are closing in. Seeking refuge at the fortress of Dún Baoiscne, Bodhmhall must confront her own turbulent history and Ireland 198 A.D.
Seeking refuge at the fortress of Dún Baoiscne, Bodhmhall must confront her own turbulent history and her scheming father to finally unearth the identity of the mysterious Adversary. Meanwhile, the woman warrior Liath Luachra has a far more direct approach in mind. The future is balanced on a precarious sword edge. No-one will escape unscathed. To ask other readers questions about Fionn, please sign up. The third volume of Brian O’Sullivan’s excellent series picks up the story – and the tension – shortly after the cliffhanger ending of the second volume. For me, the highlight of the story was learning more about the druidess Bodhmhall, her past, and the circumstances behind her exile. We meet her formidable father, Tréanmór, and get entangled in the political machinations of Dún Baioscne. And, of course, the mysterious Adversary is finally revealed. The best thing about this series is that it’s The third volume of Brian O’Sullivan’s excellent series picks up the story – and the tension – shortly after the cliffhanger ending of the second volume. For me, the highlight of the story was learning more about the druidess Bodhmhall, her past, and the circumstances behind her exile. We meet her formidable father, Tréanmór, and get entangled in the political machinations of Dún Baioscne. And, of course, the mysterious Adversary is finally revealed. Finally I had enough time to sit and read uninterrupted! I knew once I started this 3rd instalment of the series I wouldn’t want to put it down and I was right! I enjoyed this book just as much as the first two. The story unfolded at a slower pace continuing on from the end of the 2nd book. In this book you get more details of Bodhmall’s past, see a different side to Liath Luachra and the identity of the Adversary is revealed. Fantastic writing as always. I love the character of Fiacail mac Codhn Finally I had enough time to sit and read uninterrupted! I knew once I started this 3rd instalment of the series I wouldn’t want to put it down and I was right! I love the character of Fiacail mac Codhna just as much as the two strong women of the series. I'm enjoying these books immensely! I'm not a book critic so the intricacies of nuances in that respect aren't something I'm familiar with. I love adventure, Irish mythology, historical fiction and learning new Gaelic words. This series has all of that combined into a thrilling and fast-paced journey through the past. Thank you Brian O'Sullivan! “Fionn: The Adversary” is the third book in the saga of Fionn macCumhaill, better known to non-Irish speakers as Finn McCool, the legendary Irish hero. In this volume, O’Sullivan keeps up the suspense and intrigue he so masterfully established in the first two books. Once more, we are transported to second century Ireland, a land of icy streams, fetid bogs, craggy hills, impenetrable forest, and scattered hill forts. Taking a central role is young woman warrior, Liath Luachra, a sort of fierce A “Fionn: The Adversary” is the third book in the saga of Fionn macCumhaill, better known to non-Irish speakers as Finn McCool, the legendary Irish hero. In this volume, O’Sullivan keeps up the suspense and intrigue he so masterfully established in the first two books. Once more, we are transported to second century Ireland, a land of icy streams, fetid bogs, craggy hills, impenetrable forest, and scattered hill forts. Taking a central role is young woman warrior, Liath Luachra, a sort of fierce Amazon in her own right. Her friend and lover, the Druid woman, Bodhmhall, is tasked with leading her nephew, Demne (young Fionn MacCumhaill) to safety, all the while pursued by those who would do them harm. There is a traitor who appears to be feeding information to the pursuers, keeping them close at their heels. Who is the Adversary? Who is sanctioning the pursuit, capture or perhaps death of young Fionn? Who else senses that young Fionn would grow to be a force to be reckoned with? O’Sullivan’s characters are not mere sketches but full-blown personalities. We quickly come to know them, their loves, hates, ambitions, and insecurities. In short, we care about them. A wonderful storyteller, O’Sullivan takes us into the Great Wild where we travel along with the characters in their desperate attempts to elude capture. The suspense is unrelenting in this page-turner. The great thing about the books in this series is that they can each stand alone as separate novels, yet they flow seamlessly into one another should we have the good fortune to read them all. Make no mistake, although there is a smidgen of Druidic “magic” from time to time, this is no sword and sorcerer tale. This book is gritty and too real. There are politics, skullduggery, back-biting and betrayal here, things which we are all too familiar with in the modern world. For an absorbing, entrancing and exhilarating read, you won’t do better than “Fionn:The Adversary”. Book 3 of the Fionn series, takes us back into the dark and dangerous landscape of ancient Ireland. 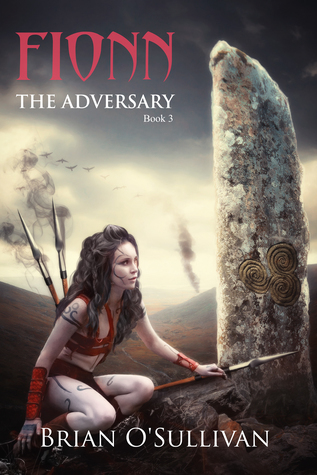 The pace of the storytelling is a little more subdued than previously and Liath Luachra, the young woman warrior, has mellowed somewhat, however she remains ruthlessly efficient when it comes to dispatching her enemies. But who exactly are her enemies, and who are her friends? A good read, I enjoyed it immensely. I am absolutely hooked on this series. I enjoy the historical/legend based context - it feels like reading fantasy. The landscapes, the excitement of pursuit and war are all aspects that make this series a great read. The Adversary tells Bodhmall's story and introduced some interesting new characters, particularly the Five Friends. Liath Luachra the heroine of the series is as intriguing as ever. This series gets better with each new book. Great read. Again like the previous books I couldn't put it down. With every book I want to know more and more about the characters past. I can't wait for the next installment. Great series, I'm enjoying each book even more than the last. The Fionn series takes a step up with this book in terms of politics and revelations. The machinations and strategic game-playing between Bodhmhall and her father were a real highlight for me as was the revelation as to why she had to leave Dun Baoiscne. The flight and fight sequences with Liath Luachra are as exciting as ever but the discovery of the Adversary's identity was a real surprise. So much revealed and yet so much more to learn. Please hurry with the next in the series! Brian O'Sullivan was born in county Cork, Ireland. On completing a degree at University College Cork, he went on to travel extensively. He is now based in New Zealand with his family but returns to Ireland on a regular basis. Brian writes fiction that incorporates strong elements of Irish culture, language, history and mythology. These include literary short stories (The Irish Muse collection), my Brian O'Sullivan was born in county Cork, Ireland. On completing a degree at University College Cork, he went on to travel extensively. He is now based in New Zealand with his family but returns to Ireland on a regular basis. Although he writes predominantly for an Irish audience, Brian's unique style and humour has meant that his books have become firm favorites of readers all around the world.